The 40th Anniversary American Music Awards (AMAs) took place at the Nokia Theatre in Los Angeles. 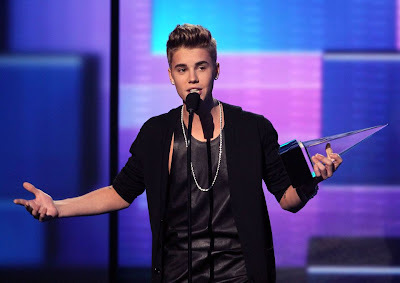 Canadian heartthrob Justin Bieber was the night's big winner taking all three awards for which he was nominated. He won the top prize of Artist of the Year, as well as Favorite Male Artist – Pop/Rock and Favorite Album – Pop/Rock for Believe. The only other multiple award-winner was Nicki Minaj, who along with Rihanna led the field with 4 nominations. Minaj won for Favorite Artist – Rap/Hip-Hop and Favorite Alvum – Rap/Hip-Hop for Pink Friday: Roman Reloaded. Rihanna's sole win was for Favorite Album – Soul/R&B on the strength of her album Talk That Talk. Among other winners were Canadian Carly Rae Jepsen, Taylor Swift, Usher, Beyoncé and Adele. Carly Rae Jepsen performed "This Kiss" and a subdued, lower version of her monster hit "Call Me, Maybe." Other performers included Usher, Taylor Swift, Kelly Clarkson, and Justing Bieber. Many performed medleys. A tribute was given to Whitney Houston, before awkwardly and abruptly transitioning to a performance by Swizz Beatz and Chris Brown. The big finale was a mashup performance by Psy and MC Hammer of their respective hits "Gangnam Style" and "2 Legit 2 Quit."